I know….I have not written in awhile. I got a little bored with usual post race play by play. And, I wondered, if I am bored my readers (mom and dad) might be too. So, I am mixing it up to tell you about Pacific Grove and Challenge Rancho Cordova. I am interviewing myself. I plan to ask the hard questions, no mercy from this interviewer. Why are you riding your bike next to the car on the street? People probably think you are pretty odd. 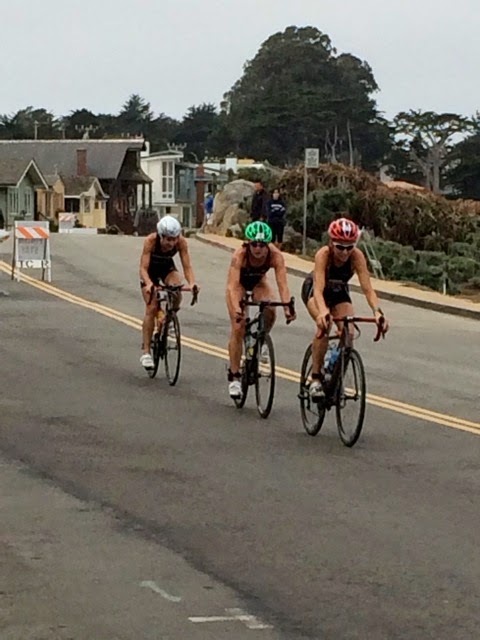 Since Pacific Grove is draft legal and a shorter race than I am used to I knew I needed to be properly warmed up. I am also old so it takes awhile to get going. 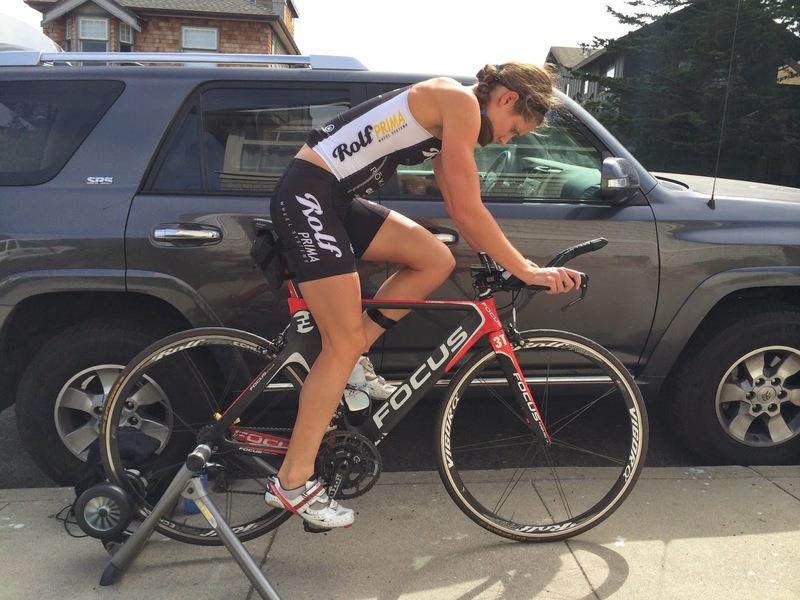 In the past the announcers provide commentary during the race and I have heard them saying while I am biking past that I should catch back up because I do longer races (70.3s) and it takes me awhile to get up to speed. Ouch. I did not want them to say that this year. 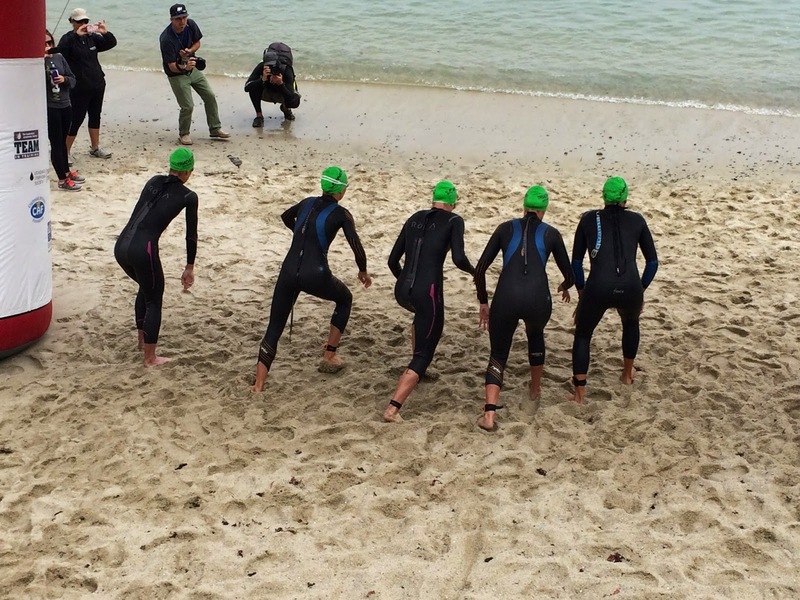 It also helps me at the start of the swim. In the picture of the swim start the three women in the middle are all moving while the two on the outside are stuck in place. What the heck is going on? That is a photographic evidence of what happens to your reaction time as you age. The two women on the outside (me in the Roka on the left and Julie Ertel on the right) were the oldest women in the race by quite a bit. I am 37 and Julie is 41 or so. The other three women on the start line were in their 20s. They gave a ten second warning for the start and then we had to wait for the horn. When I heard the horn I could feel my brain sending the signal to my feet to move. To be honest, it really stinks. I like when they give us a full countdown because they I can begin “reacting” when they say one and be moving at the actual start. Luckily, once I get moving I am okay. I think it is the key as you age. If you stop moving it’s pretty hard to start again. So, I hope to remain active until I drop dead. You made the front pack for the first time ever at this race–great work! However, I think you probably need to be closer to the wheel in front of you? Yes, I definitely need some work on the finer points of draft legal racing. The two women I was riding with do this style of racing regularly. My bike handling is okay and I have done group rides in the past but I need to become more comfortable sitting close to other rider’s wheels. Also, I did not want to be the non-draft racer who crashed one of them out! In the end, I probably did a little extra work since I did not get super close but I still was able to recover on the back and get ready for my next pull. It was fun! Given the small field at the race it was entirely possible I would have had to do the bike alone. If that was the case I wanted to be prepared and save some watts. I was not the only one—I think Tommy Zaferes was wearing a bright pink Rudy Project Wingspan. 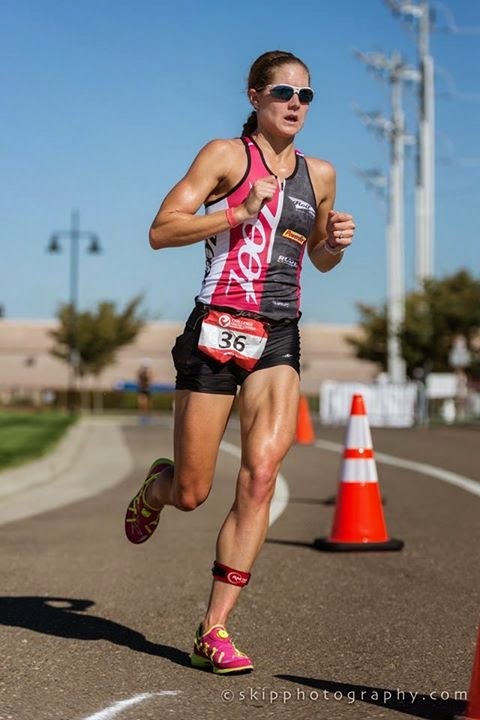 What in the world is going on with your arms while you are running? It looks like you have chicken wings. After seeing some pictures from the race and having some random guy yelling at me quiet my upper body I knew this needed to be addressed. Earlier this year I focused on relaxing my shoulders and consequently starting swinging my arms around like a crazy person. Did you ever see that Friends episode where Rachel was embarrassed to run with Phoebe? It was kind of like that. It is a huge energy waster and was also slowing down my cadence. My foot would be stuck on the ground waiting for my shoulders to get back in place before I could start my next stride. It was very inefficient. After this race I became obsessed with arm carriage and made some simple changes that seemed to have helped. You finished PG in third and were only :19 behind second place? Was that frustrating? You need to have some heart and catch those women in front of you. Ugh–I know. I caught up to Brianna the first loop after she had a quicker T2 and then she gapped me on a short downhill. I spent the rest of the race chasing. I got pretty close on the final short incline but could not quite get there. I was 5 minutes faster than I ever have been on the course but it still stung a little. Katie Hursey, the winner, took off the first loop and we never saw her again. We actually told her on the bike she probably had it. I have seen her running splits. I am not one to count myself out but I also know what I can realistically run. Dropping a 35-36 minute 10k is a big ask. 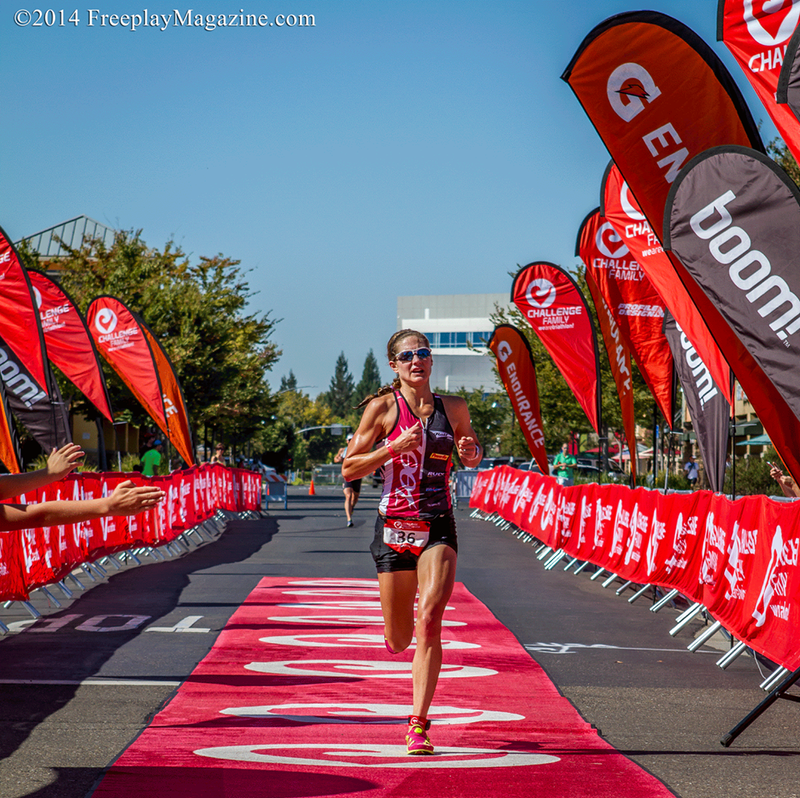 At your next race, Challenge Rancho Cordova, the water temperature was 68.4°—non wetsuit for the Pros. How did you feel about that? As a swimmer a non wetsuit swim is usually a good thing. However, as a swimmer who does not do well in the cold this was a bad thing. When I swim in cold water I start out fine but then I get slower and slower. I also begin to hate swimming. At RC I actually was breathing towards the shore and I contemplated just swimming to the beach and quitting. No joke. It is like the cold water enters my brain and turns me into the most negative and mean person in the world. However, I am pretty stubborn so I knew getting to the swim finish and getting to shore were basically the same thing so I kept going. I truly hated it. I was frustrated because I had been swimming really well leading into the race and I felt like I was not able to capitalize on it. Everyone else had to deal with it as well and ultimately, I don’t think it changed the outcome of the race. When you saw your husband at mile 2 on the bike you told him you were freezing. Shouldn’t you be focused and trying to be positive? I saw him standing in front of our hotel which was on a slight uphill so I had time to say a few words. I think no matter what you do out there negative thoughts are going to come into your head. I just try not to entertain them and let them fester. I have them and then I move on. Often, I feel like the more I “fight” the thought the more I give it life. So I just let it move through my head and then let it go. At that moment in the race I was freezing. However, I was riding as hard as I could to warm up. That was the solution to my problem. Racing is about problem solving so that was the way I was going to fix the situation. The sun got higher in the sky and it was going to be a hot day so it warmed up quickly. When it did I felt better, passed a few women back who had passed me at the beginning of the bike and got to work. After the cold swim it ended up to be a warm day out there and the bike was exposed (sunny) the whole ride. How was your nutrition and hydration? I was a little behind on hydration at the beginning since I was less inclined to drink while I was cold. I forced a bit down but I made sure to catch back up once I got warm. At one point I must have put a little too much down because I puked a small amount back up! The first time that ever happened to me in a race. Thankfully, I did not feel bad at all. I waited five minutes to drink/eat more and then carried on per usual. Jillian Peterson was riding behind me (the legal distance) at the time and I hope she did not get hit with anything. You came into T2 in 4th, about 1 minute ahead of Jillian Peterson and Abby Geurink. Did you make a move at the end of the bike? How was the first loop of the run? In the picture the chicken wings seem to be better. I felt okay off the bike. Jillian caught up and passed me about 1.5 miles in so while I felt I was running pretty well the way she passed me made me question what was actually going on. Perhaps my run was sucking pretty badly?!?! I got frustrated and had a little temper tantrum in my head about what the f*&^ was wrong with my running. I even started thinking about what I needed to do this winter to fix the situation. I also blamed it on my old age because I have read the run is the first thing to go. Even though I had these random thoughts I made sure to focus on nutrition and hydration because you never know what might happen. It is 13 miles, not two. Well, we all know what happened…you got passed again and dropped from 4th to 6th in the first loop. Not the plan I guess? Definitely not. I still felt pretty solid. Jillian had build up a 1 minute lead and Abby was not pulling away super quickly. I thought back to Wildflower and how I was passed in the first 5 miles and then was able to rally and take a place back. I believed this could happen here. I kept taking gels (4 of them during the run) and focusing on staying efficient—no chicken wings! The gap between Abby and I stayed the same but I could tell we were pulling back Jillian. Abby caught up to her first and I watched as Jillian tried to hang on. I remained patient and waited for the rubber band to break and then made a move on the one slight incline on the run course. I could hear Jillian fall back and with 2.5 miles left I just had Abby in front of me. Photo Courtesy of Sean Dulany, FreePlay Magazine. What happened in those last couple miles? I began to notice I was closing in a bit on Abby. At first, she would be all the way across an intersection when I entered it but then I began to notice I would be partway across the intersection before she had made it to the other side. It is funny the things you say in your head in this type of situation. I knew passing her for third place was definitely a possibility but there was also a voice in my head that said, “4th is great! You moved up and almost made it to 3rd, you can finish and be proud.” I think you know how much it is going to hurt to go for it and you try to justify not enduring the pain (and possibility of failure) by congratulating yourself on what you have accomplished. 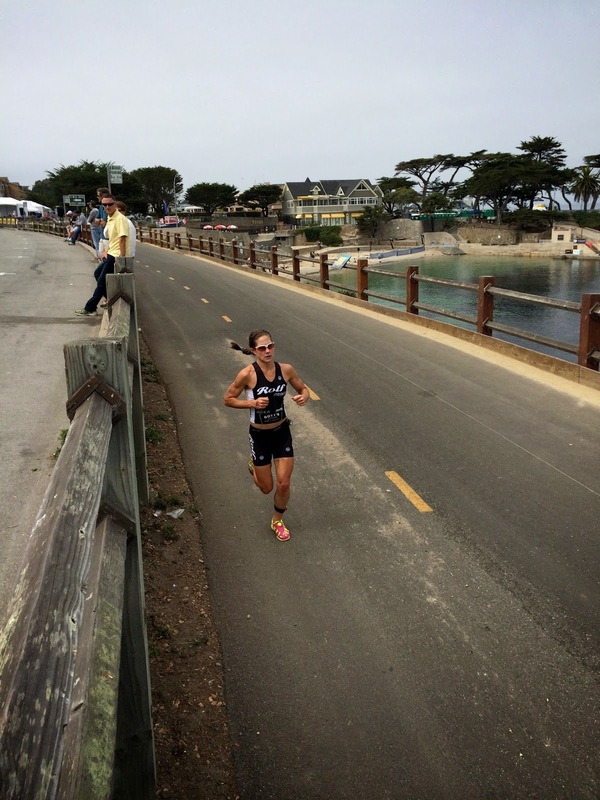 I remember feeling the same thing at Alcatraz in 2012 when I passed Becky Lavelle for 4th in the last 600m of the race. Top 5 had been my goal and I had achieved it and then I really had to hurt myself to make the pass and get 4th. I wanted the podium at Challenge RC. I told myself there was no way I was NOT going to finish on the podium if I was this close to it. To me one of two things was going to happen; I was either going to be 3rd OR I was going to have to walk/crawl it in because I ran my legs to the point of failure trying to be 3rd. I made the pass with about 800m to go fully prepared for Abby to come with me. I went around her and pretended it was the last 800m repeat of a track workout. I am sure I was running nowhere close to that type of speed but the pain was there. They took us on one last teeny out and back I had not anticipated before entering the finish chute. It was such a cruel trick! I hung on and finished 3rd, :21 in front of Abby, and surprised Andy in the process. The last time he saw me I was in 6th. I don’t think he expected me to come down the chute in 3rd. The great thing about that picture…my elbows are in! 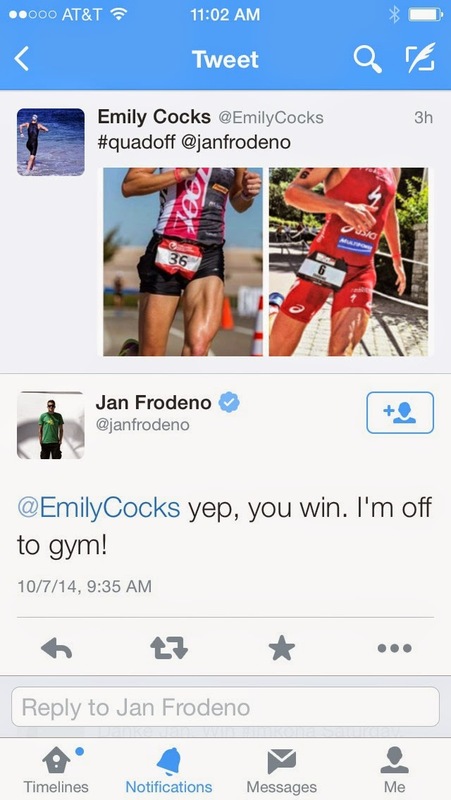 What is the story with this tweet to Jan Frodeno? You can’t possibly think you can even compare to a guy who wins races like the Olympics (and gets 3rd in Kona after a few issues on the bike)? Haha. Definitely not. I just thought it was funny. I think he wins the #quadoff too. He was just being nice. Anything else this year or are you enjoying some down time? I am hitting up Lifetime Oceanside on October 26 and then taking some time off. A little speed to round out the season. 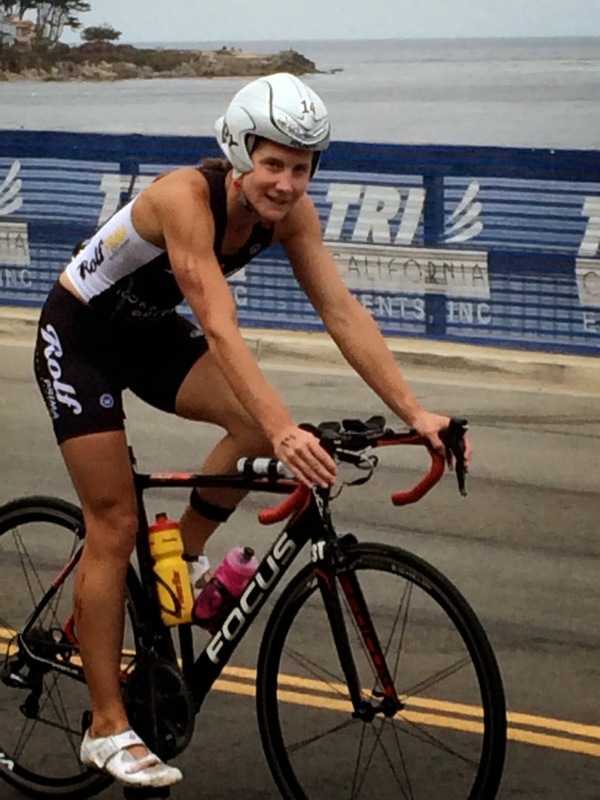 Also, I raced my first race of the year in Oceanside so it comes full circle to end the season there as well.